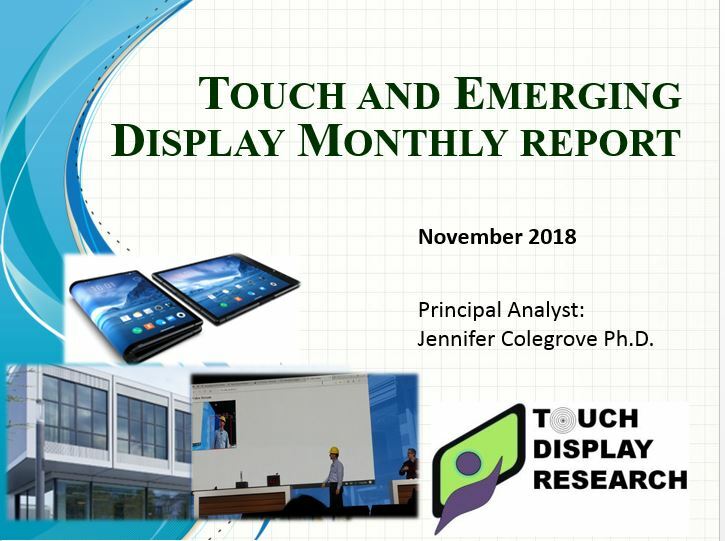 Flexible curved display Archives - Touch Display Research, Inc.
November 27, 2018, by Jennifer Colegrove Ph.D. Principal Analyst, Touch Display Research Inc.
An industry expert once said, “AMOLED display’s biggest contribution is to push LCD to become better and better.” That statement is so true. In recent ten years, AMOLED displays from Samsung Displays, LG Display and other manufacturers have become widely available, and are considered high-end displays with wider color gamut, faster response time, and are thinner, lighter in weight, and can be curved/flexible/rollable, etc. LCD engineers won’t stand still, and have invented many methods to improve LCDs to match AMOLED’s performance, and kept the longer life time and lower price. 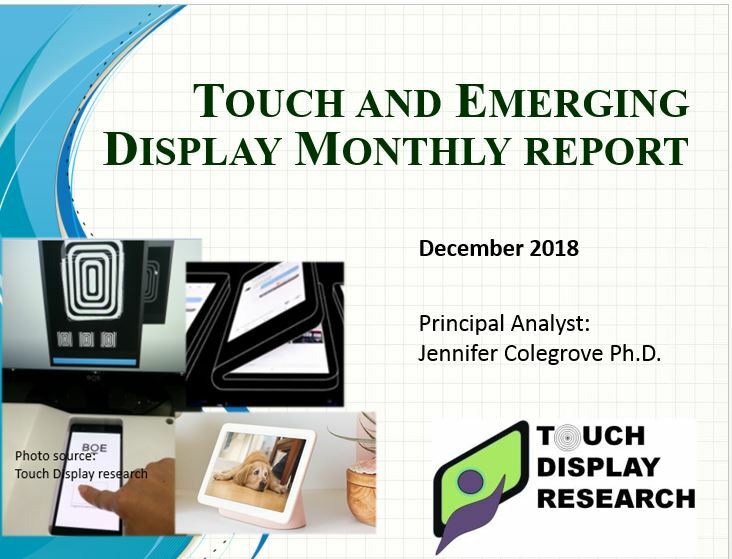 To continue reading, please subscribe to the Touch and Emerging Display monthly report. This entry was posted in AMOLED, Displays, Flexible curved display, Flexible display ecosystem, Flexible display market, Flexible hybrid electronics, Flexible OLED, LCD and tagged advanced LCD, AMOLED, LCD, touch and emerging display on November 27, 2018 by jennycolegrove. September 13, 2018, by Jennifer Colegrove Ph.D. Principal Analyst, Touch Display Research Inc. This week Apple announced the new iPhones and the new Watch for this holiday season. The new Apple Watch series 4 adopted a larger AMOLED display, which has 30% bigger display than its predecessor…..
To continue reading, please subscribe in the membership page. Thanks. If you are already a member, you can log in and see the full article. Thanks. 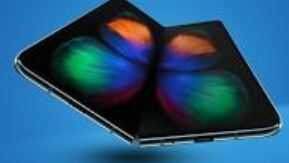 This entry was posted in Displays, Flexible curved display, Flexible display market, Flexible OLED, OLED, Touch screens and tagged Apple, Apple Watch, LTPO, OLED, TFT on September 13, 2018 by jennycolegrove. August 28th, 2018 By Jennifer Colegrove Ph.D. Principal Analyst, Touch Display Research Inc. This week, Touch Display Research interviewed Plastic Logic’s CEO, Mr. Tim Burne, about their flexible e-paper display and flexible touch screen. Mr. Tim Burne joined Plastic Logic in 2013 and became the CEO in 2015. Mr. Burne indicated Plastic Logic’s organic TFT (OTFT) backplane is very flexible and robust, thus it is very suitable for the curved wearable devices and many other applications. 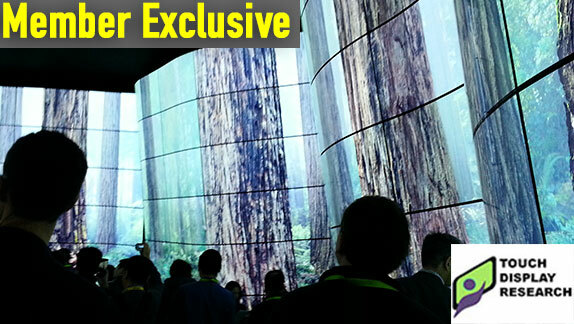 source: Touch Display Research Inc. 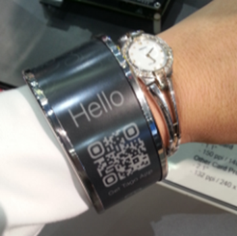 I tried on the bracelet with a flexible curved e-paper display, see picture here. More information of the interview and analysis can be found in the Touch and Emerging Display monthly report and online market analysis articles for members. 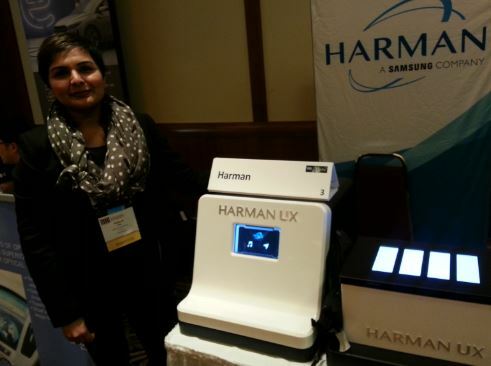 This entry was posted in bi-stable display, Displays, Flexible curved display, Flexible display ecosystem, Flexible display market, Flexible touch screen, Touch screens and tagged e-paper dislay, flexible and curved, flexible display, Plastic Logic, Tim Burne, wearable devices, wearable display on August 28, 2018 by jennycolegrove. August 22, 2018, by Jennifer Colegrove Ph.D. Principal Analyst, Touch Display Research Inc. This article is for members only. To become a member, please subscribe in the membership page. Thanks. 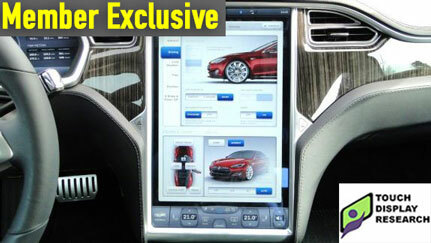 If you are already a member, you can log in and see the full article. Thanks. August 20, 2018, by Jennifer Colegrove Ph.D. 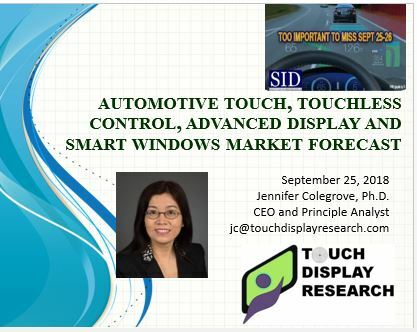 Principal Analyst, Touch Display Research Inc.
August 18, 2018, by Jennifer Colegrove Ph.D. Principal Analyst, Touch Display Research Inc.
August 16, 2018, by Jennifer Colegrove Ph.D. Principal Analyst, Touch Display Research Inc. This entry was posted in AMOLED, anti fingerprint, anti smudge, automotive, bi-stable display, Displays, Flexible curved display, Flexible display ecosystem, Flexible display market, Flexible hybrid electronics, Flexible Lighting, Flexible OLED, Flexible touch screen, Glass, micro LED, micro LED display, micro LED market report, micro LED report, microdisplay, Mini LED, OLED, touch screen, Touch screens and tagged anti fingerprint, anti smudge, anti-fingerprint coating, Flexible bendable curved display, flexible display, flexible display 2018, flexible display market, flexible display market forecast, Flexible display market report, micro LED, micro LED and mini LED, micro LED market, micro LED report, Tesla, touch display on August 22, 2018 by jennycolegrove. May 24, 2018, by Jennifer Colegrove Ph.D. I just returned from SID DisplayWeek 2018 in the beautiful Log Angeles, California. It was my honor to meet some of you in person. When I asked the president of SID– Dr. Helge Seetzen at Tandemlaunch—on Tuesday, he indicated this year’s conference had broken the record with over 6400 people registered, and there may be more in the next couple of days. According to the SID Seminar chair—Dr. Ray Ma at Nanosys–, the attendees of the Monday seminar is also a record high, with over 800 people registered for Monday seminars. 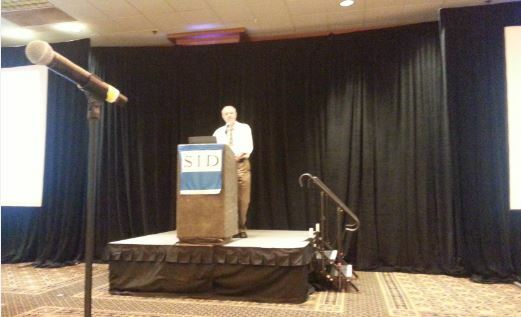 Good job, applause to the SID DisplayWeek committees. I was excited and honored to be invited and taught a seminar at SID DisplayWeek again. The 90-minutes seminar is about Display and Emerging Technologies Market Forecast –LCD, OLED, e-paper, touch screen, smart windows and voice recognition. Photo credit: Dr. Bin Wang at Eastman. 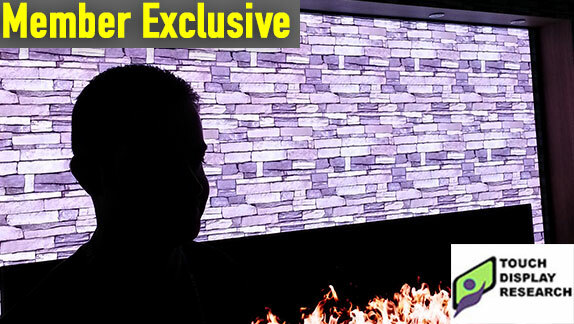 Flexible display, quantum dots, smart windows, touch panels, micro LEDs are hot topics at SID 2018. Each of these fields has some as expected, and also has some surprises. 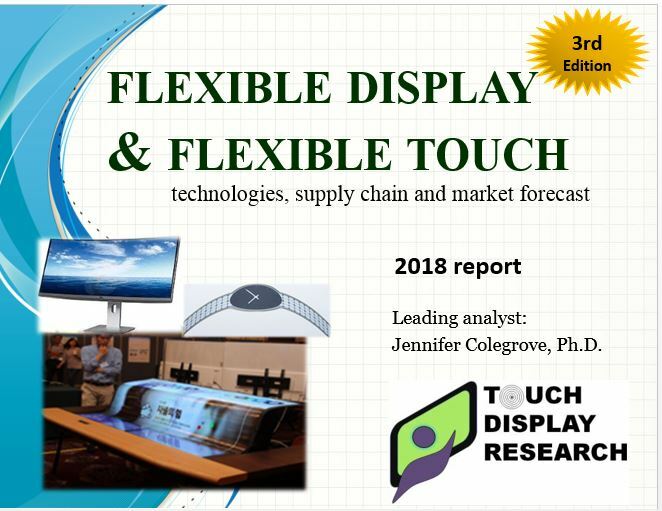 In the recently published “Flexible display and flexible touch 2018 report, 3rd edition,” Touch Display Research Inc., analyzed over 10 flexible display technologies in 13 application markets, with detail of substrate material type and form factor. 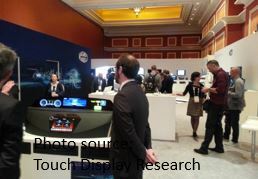 More than 270 companies working on flexible display and flexible touch screens are profiled in the report. What are the surprises of each hot topics? More analysis of SID 2018 can be found in the “Touch and Emerging Display” monthly report. This entry was posted in Conference Review, Displays, Flexible curved display, Flexible display market, Flexible hybrid electronics, Flexible OLED, Flexible touch screen, Quantum dot, Quantum dot market forecast, SID 2018 and tagged flexible display, micro LED, quantum dot, SID 2018, SID DisplayWeek 2018, smart window, touch panels on May 24, 2018 by jennycolegrove.